For SIHH 2018 Cartier takes inspiration from yet again from the brand’s vintage mystery clocks from the early 20th century. 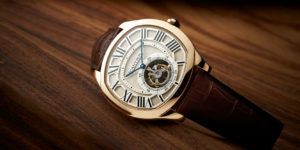 The SIHH 2018 Cartier Rotonde Double Tourbillon Mystérieux Squelette is a follow up to that 2013 edition Rotonde de Cartier Mysterious Double Tourbillon except this time in even smaller quantity – a limited production of 30 pieces; and skeletonised! 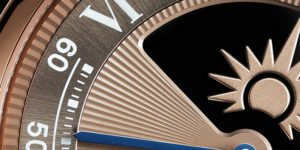 Working on the same principle of a toothed rim sapphire disc driven by gears hidden like the vintage “mysterious” clocks, the SIHH 2018 Cartier Rotonde Double Tourbillon Mystérieux Squelette is a 42mm platinum double tourbillon encased with double sapphire crystals on the front and back, highlighting the mystery of the Swiss manual-wind Cartier in-house caliber 9465 MC with 26 jewels, 21,600 vph and a power reserve of 52 hours. Featuring the Geneva Seal, the Squelette or Skeleton timepiece is assembled and decorated to exemplify the highest horology standards as befitting a timepiece with the coveted shield. 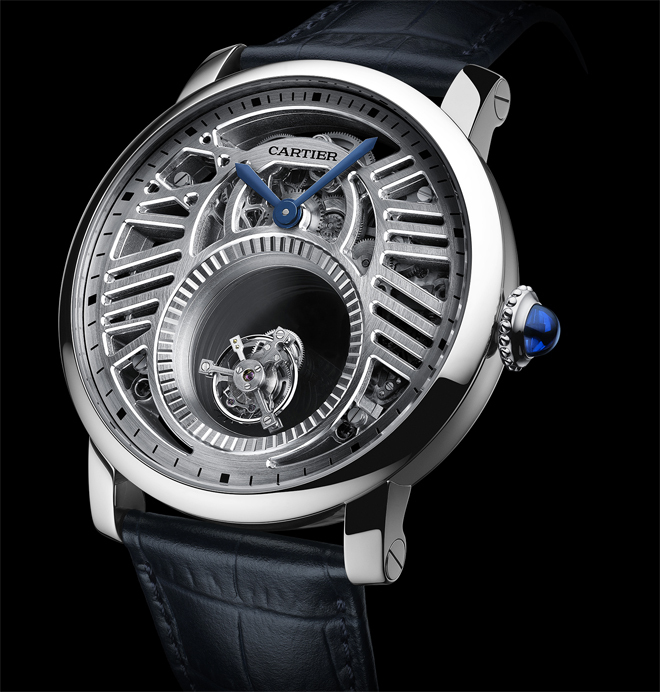 The dial of the of the new Cartier Rotonde Double Tourbillon Mystérieux Squelette presents a face with skeletonized Roman numerals and blued steel hands, operated via Cabochon sapphire crown. 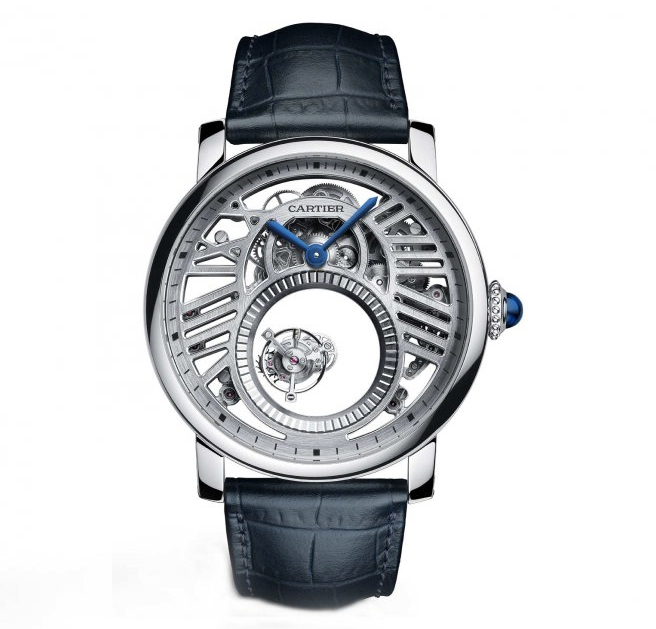 The limited edition new Cartier Skeleton watch is likely to follow other watches in the family with its bridges and base plate crafted in German silver to provide the necessary rigidity as a result of fragility resulting from the skeletonisation process. German Silver is somewhat of a misnomer, as it does not actually contain any silver but is instead a mixed alloy of nickel, copper, and zinc. 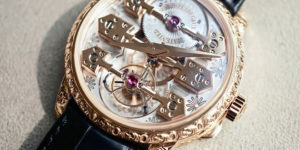 Sister brand, A. Lange and Sohne elects to use German silver for its calibres due to its durability coupled with relative ease of decoration and crafting. 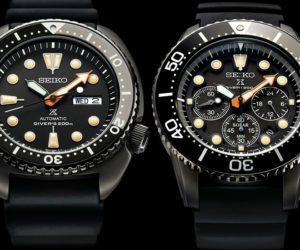 The new watch for SIHH 2018 comes on a matching marine blue alligator leather strap with an 18kt white gold deployant. The Rotonde Double Tourbillon Mystérieux Squelette follows up on Cartier’s SIHH 2017 where they launched the Rotonde de Cartier Skeleton Mysterious Hour.